I’ve always had a tendency to be a little anxious, but I wasn’t aware of it being a serious problem until my final year at uni, when after a period of feeling low, I came home from a night out and had a panic attack in the living room. It was one of the scariest experiences of my life, as I gasped again and again for air, feeling the panic rise and rise as I struggled to breathe. It wasn’t to be the last panic attack I would have, as sometime soon after I found myself in a friend’s bedroom in Manchester getting ready for a night out and gasping for air once again. At least this time there were people around to help calm me down. On both occasions I had had a few drinks, which of course can make anxiety worse, so for several months I stopped drinking alcohol and going out, in a bid to avoid the experience happening again. Yet one afternoon after a relaxed day in town, I was sat in my bedroom when it happened once again. My housemate at the time helped me to slow my breathing and get a handle on it, but it felt terrifying that I couldn’t prevent the experience by staying sober – I thought I’d gained at least some sort of control over it. During that year, the sadness and anxiety I felt inside seemed to cripple me. I sought help and started taking medication as well as talking to someone, these things helped somewhat. I also resorted to some less healthy coping mechanisms. As the year progressed and deadlines loomed, I found it harder and harder to function. A growing social anxiety meant I started to miss seminars; I would sit at home in front of my laptop screen trying to write my final essays and feel panicked and hopeless. Thankfully, I had a kind and supportive tutor, a very caring church community, lots of prayer and the most wonderful friends who saw me through the pain of that year. If it wasn’t for these people I’m not sure I would’ve graduated. After we finished, I was so exhausted from the year’s events that I decided to take a year out for me. I worked part time in a clothes shop, waitressed and did some language tutoring, whilst living with two great girls, and whilst financially it wasn’t ideal, it was the single best thing I could’ve done for my mental health. In fact, it was that year that I started this little blog of mine. I’d like to say that now, five years on, life is peachy and none of the above feels familiar…a line graph would show my mental health going up in a perfect diagonal. But real life doesn’t follow a straight path, and whilst that line has generally gone in a positive direction, there have been plenty of ups and downs. To me, that’s no bad thing, to say that not once since 2012 have I felt as desperate and out of control as I did then is huge. Over the last couple of months or so, anxiety has reared its ugly head in my life with a vengeance. I’ve woken up feeling sick in the pit of my stomach, I’ve felt regularly on the verge of tears, simple tasks have felt overwhelming and social occasions too much. At times I’ve felt like the person staring back at me in the mirror isn’t me, as I’ve put less and less effort into my appearance. I’ve looked back at old photos wistfully, where I’d felt pretty and fun, I’ve wondered where that person has gone as I’ve burrowed down under a blanket for yet another night. I don’t pretend to have ever been a party girl – I’ve always been an introvert and liked my home comforts. But recently I can see the difference that some days, staying at home hasn’t felt like an option, but the only option. And the last week of snow hasn’t helped, as I’ve wanted more than ever to hibernate and retreat. Thankfully, there are things in life that have stopped me doing that 24/7, because I have a job to go to, bunnies to feed and look after, and some very kind and caring people in my life. So that’s where I’m at, and writing to you about it has felt fairly terrifying. But I’m conscious that a lot of people are feeling similar things. 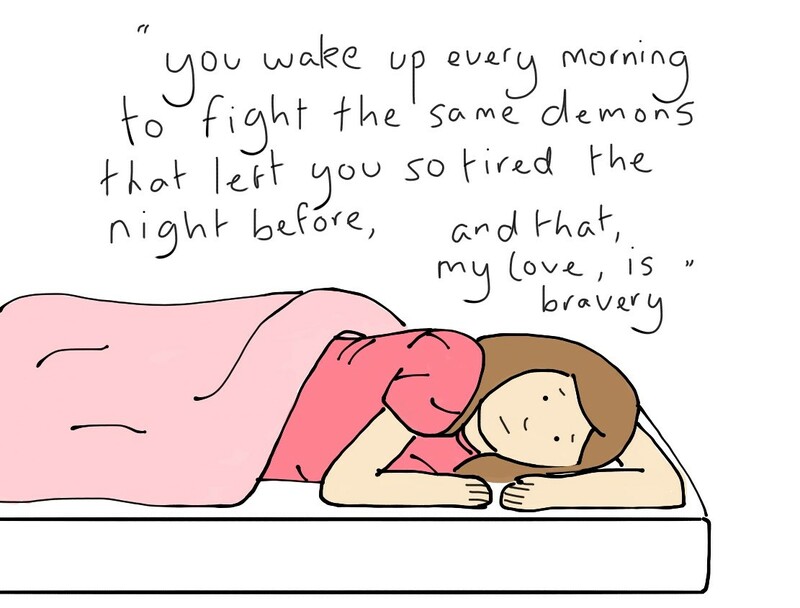 In recent conversations with different friends, more and more have bravely spoken to me about the anxiety they’ve struggled with or are struggling with, talked openly about the medication they’re taking, and shared their pain. More often than not you would never have guessed it, which I suppose is why they say don’t judge a book by its cover, because however ‘sorted’ someone might seem, we’re all dealing with stuff under the surface. I wanted to write this blog partly to express my own feelings, but also to let you know that you don’t need to feel ashamed or alone if you’re struggling with your mental health. You are in fact the very opposite – braver and stronger than you know. There is always a light at the end of the tunnel, just like there’s a spring at the end of this winter. I thought I’d include the Samaritans phone number here; whatever you’re going through you can call them for free on 116 123.